What does Valentine's Day really mean to me? What does Valentine’s Day really mean to me? Some people love Valentine’s Day, the chance to buy ridiculously overpriced and oversized teddy bears, cheesy cards and pink chocolates to show whomever they’re with that they do, in fact, still love them. It’s great, if you’re in to that thing. For others, much like myself, Valentin’s Day is a consumerist, capitalist holiday serving no other purpose than making card and flowers companies an extortionate amount of money. According to finder.com, 2018 was estimated to see 22 million Brits celebrate Valentine’s Day, totally 52.8% of the population. However, a large 31.2% were choosing not to celebrate, and 16% planned to celebrate but not spend anything. Those who were celebrating were estimated to spend an average of £28.45. That is a lot of money, and as a student, that is a ridiculous amount of money; I could do a month’s grocery shop with £28.45! Thebalance.com has reported a record spending in the US on Valentine’s Day this year with an estimated $20.7 billion dollars being spent, higher than the $19.2 spent in 2018 and the previous record of $19.7 billion set in 2016. And all of this is going straight into the country’s back pocket. Don’t get me wrong, it feels great to be showered with love and affection, I just don’t think that you should be receiving said shower out of obligation. We are told that Valentine’s Day is a day to tell your loved ones that you love them, to spoil them with jewellery and candy and expensive dinners, but that is exactly my point, we are told to do it. In my opinion, people shouldn’t need an excuse to show their loved ones that they love them, you should be doing it all the time. Don’t wait for Valentine’s Day to buy your significant other some flowers, buy them when you feel like buying them. Maybe I’m biased; I’ve never actually celebrated a Valentine’s Day with someone until this year, so maybe my disinterest in the day is spurred on by my lack of involvement with it over my life so far. What I can say though, just from my experience this year, is that there is a lot of pressure put on this day. Pressure to buy the perfect gift, write the perfect card, create the perfect evening, pressure to just spend a whole load of money because if you don’t, well then obviously you don’t love them that much, right? 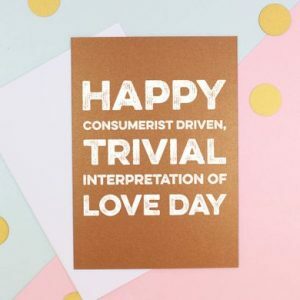 So not only do people feel an obligation to proclaim their undying love on this particular day, they also feel a huge amount of pressure to make it the best day/night ever in fear that their significant other will doubt their love if they don’t. I don’t know about you, but that’s a pressure and obligation I’m willing to miss out on.